South Broadway once had some stately homes, with great views overlooking the Mississippi River. 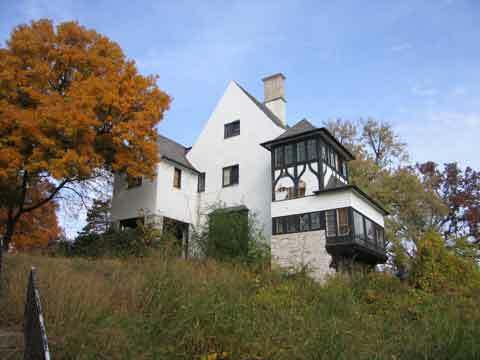 In early 2006 one was gone — razed for a multi-building condo project known as Mississippi Bluffs. 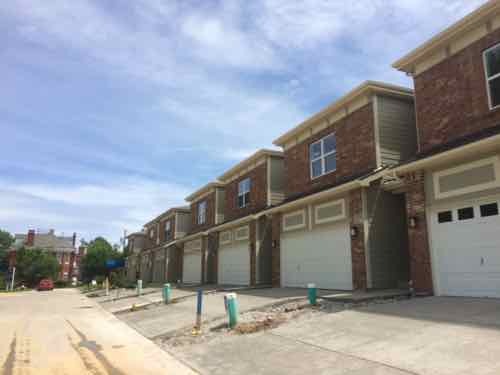 He’s building an oasis of 34 high-end condominiums on the Mississippi, each with its own garage and surrounded by 6.2 acres of park, sidewalks for dog walking and jogging, and a large pool. It sits on the city’s only mile of terrain above the flood plain, 80 feet above the Mississippi, perfectly positioned for views of the barge industry to the north, vast river to the south and Illinois forest to the east. Now, if only he could sell that idea to everyone else. Many questioned the plan and the developer’s ability to perform. See map. But the balance of the site remained vacant for years. Now the plan has changed — not for the better. The view from the North entry, where the Doering once stood. Garage doors are highly visible from Broadway. Their views of the river are stunning. It’s certainly possible had the Doering Mansion not been razed it would still be vacant and falling apart, but it’s also possible it would’ve been renovated and occupied years ago. A trusted politically-connected developer was allowed to raze one the few remaining mansions in a historic district because his project would fail without doing so. It failed anyway. If only the Doering Mansion had been offered for sale on its own, only then would we have known if anyone would’ve been interested in renovating it. I’m just glad I don’t get down to this area very much anymore, I’d hate to see these garages on a regular basis. What Will Become of the Historic Former Arsenal Site Once the National Geospatial-Intellegence Agency Relocates? 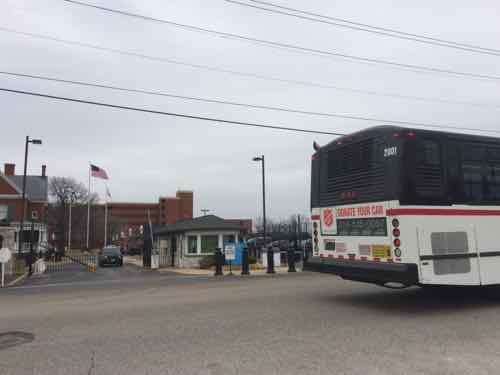 St. Clair County has agreed to donate land near Scott Air Force Base and MidAmerica Airport to the combined defense and intelligence agency, which provides mapping support for the U.S. military and employs 3,000 people locally. 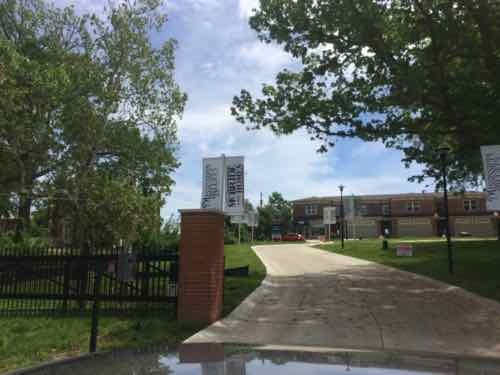 I’ve questioned the wisdom of the city site from a design viewpoint, see St. Louis’ Low Standards Turns A Once-Proud City Into A Suburban Office Park. Keeping these jobs in the city makes sense financially, though employees who also live in the city will still pay earnings tax. This post, however, isn’t about the new site — it’s about the current site and what will become of it once the NGA relocates. 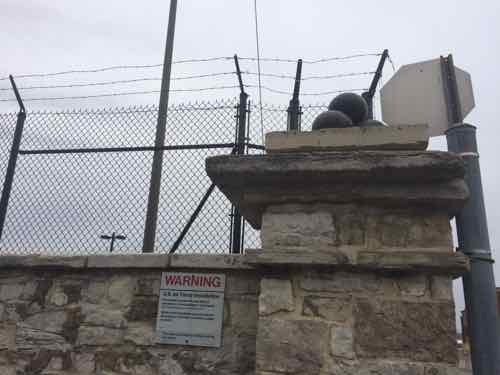 The site is well protected, the cannonballs on top of the stone posts pay tribute to the days when this was a federal arsenal — hence Arsenal St.
An employee leaving the site to catch the next bus. 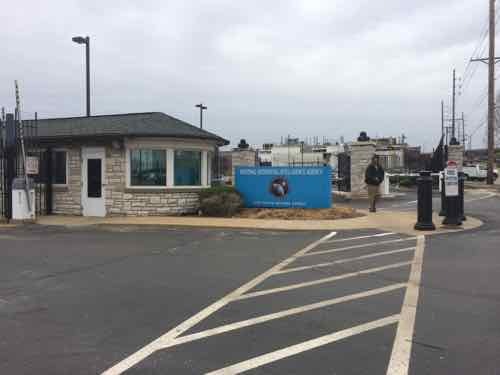 City records don’t list any information about any of the buildings on the site — makes sense since it’s a spy agency located on Air Force property. Thankfully the St. Louis Air Force Station was listed on the National Register of Historic Places in January 1975. 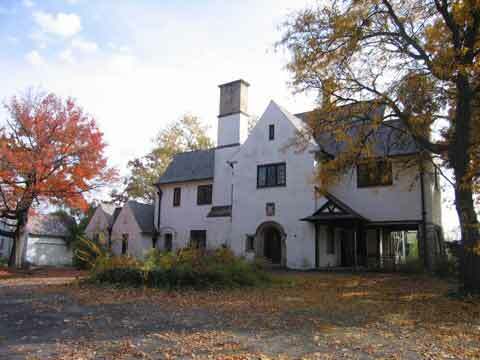 Within the confines of this acreage are ten buildings with erection dates from 1830 to 1906. These buildings are of Federal architecture, and are arranged in such a manner that gives an excellent example of the building prac tices and a remnant layout of a major arsenal of the early 19th Century. 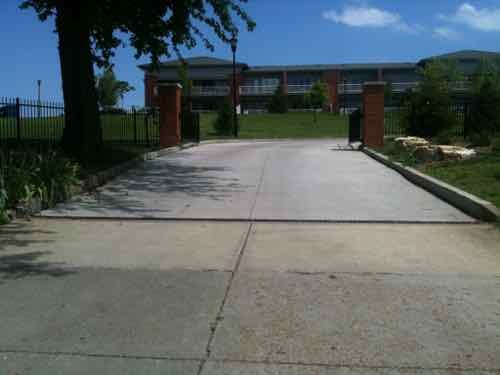 Of particular interest are buildings #4 and #5, which are two of the oldest and best preserved buildings on base. Both are constructed of limestone walls over stone foundations, and their site and architectural integrity has not been altered since they were built in the l830’s. These buildings are built in the Federal style of architecture, which characterizes the majority of the other buildings except buildings 20 and 22 which are of modified Federal architecture. A further exception to this style is evident in building #25, which was constructed in 1906, and is believed to be of modified French Colonial architecture. It should also be noted that building #1 has lost its architectural integrity through extensive modification, but it was of modified Federal architecture before remodeling. One large multi-story building on the site was built after 1975. What will become of this property once the NGA vacates? The other day, while waiting at a red light, I noticed a business had opened in an old filling station at Eichelberger & S. Kingshighway. The ice cream shop is called The Filling Station. 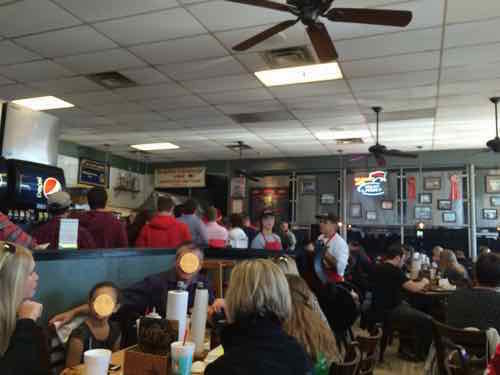 The Filling Station opened in 2013, click image to see entry on Yelp. I haven’t patronized the business so I can’t speak to the food or service. However, I can say I love the building and its use as a restaurant. 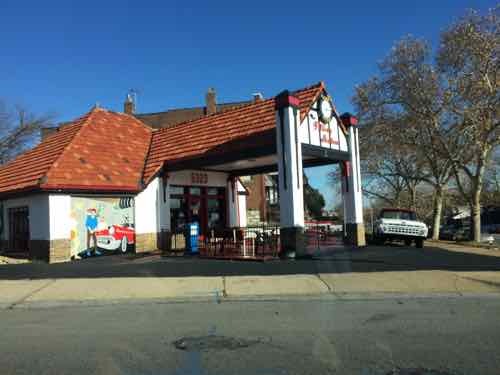 Before the light turned green I was thinking about the lunch my husband and I had in Kansas City, at a place I thought was a former gas station. Joe’s Kansas City, formerly Oklahoma Joe’s, is among the most popular BBQ restaurants in Kansas City, thankfully we arrived before the line was out the door. It was after we ate that I realized this was still a functional gas station! As a vegetarian I don’t visit BBQ places, but I’d read about their portobello sandwich: The Portobello Z-Man Sandwich $7.39 (smoked portobella, smoked provolone cheese, topped with two crispy onion rings, on a toasted Kaiser roll). 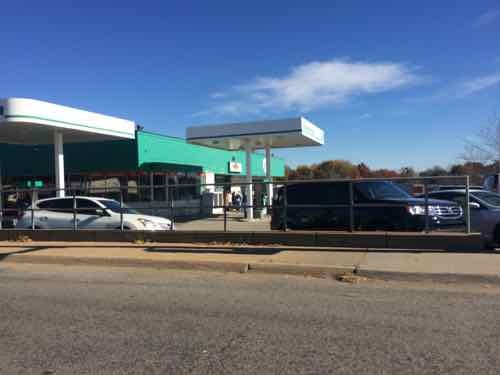 The operating gas station in KC doesn’t have the architectural charm of the older & smaller building in south St. Louis, but the idea is great. 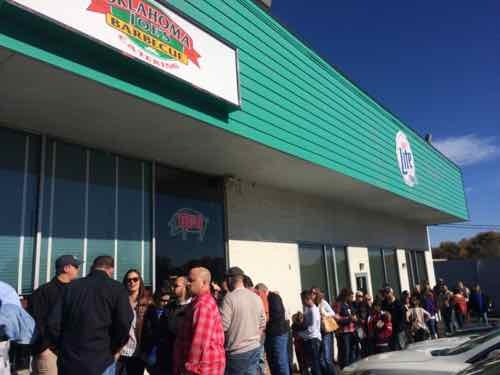 What a great way for someone wanting to get into the restaurant business — opening up inside an existing gas station. I’m curious how many gas stations we have in the region that have lunch counters inside. If you’ve got a great product, you could do well. Have a great weekend, see you at 8am Sunday for a one day poll (8am-8pm). The special election is a week from tomorrow, Tuesday October 7, 2014. Previous post: Upcoming 15th Ward Special Election In Three Weeks; Candidate Forum Monday September 29, 2014. In a special election on October 7, voters if the 15th Ward will elect a new alderperson. Three candidates are running for the open seat, and this event will allow them to share their views and passions. The format will be simple: the moderator will pose questions with yes or no answers, and then allow each candidate time for the short one-word answer and an elaboration. People will leave knowing without a doubt where these candidates stand. Clear answers make informed voters who make a stronger city. 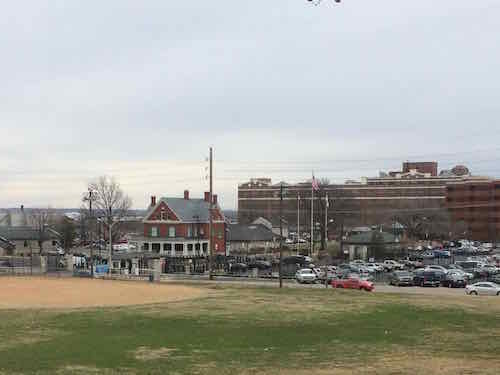 The Royale is a great venue because it serves Tower Grove South, the ward’s largest neighborhood. While currently located in the 10th ward, the Royale has been previously included in other wards before including the 15th, and has many patrons within the 15th. In 2023, when the city reduces from 28 to 14 wards, who knows — the Royale could be represented by one of the four stars of this evening’s event! Neither the Royale nor the moderator have endorsed or otherwise supported any of the four candidates, or any committee that has endorsed or supported them. Fair and impartial, y’all. If you’re a 15th ward voter please try to attend one or both of these events. 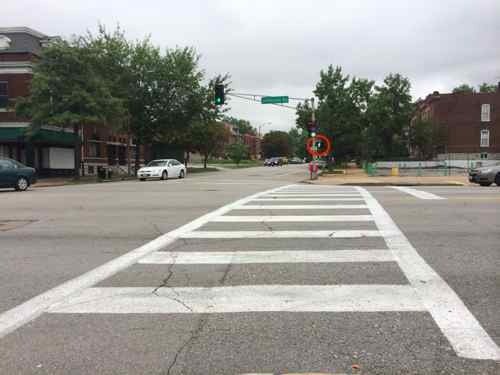 A year ago I posted about a need to improve the pedestrian experience at Jefferson & Russell (map), see Jefferson Avenue Needs A Road Diet, Corridor Study Part 1. 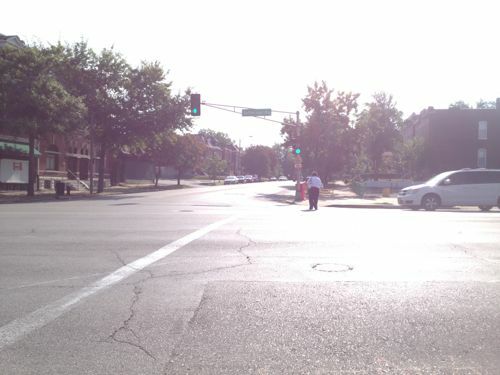 September 2014: Within the last year automatic pedestrian signals have been added (circled in red) and the crosswalks made more visible. 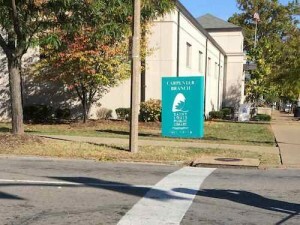 It’s a small start, a few low-cost improvements until a new streetscape can be planned and funded. For those who cross Jefferson at Russell these are welcomed changes.